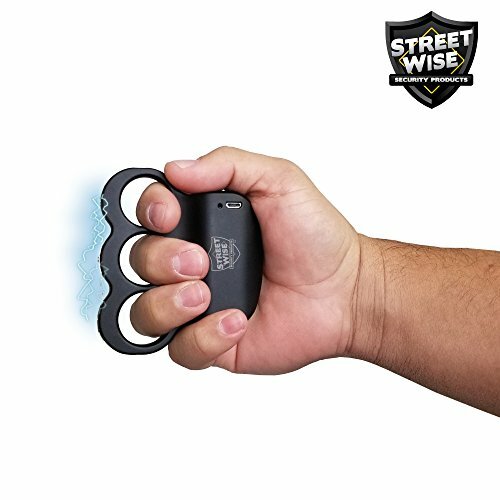 Slip the patent pending Triple Sting Ring Stun Gun through your fingers and you will walk with confidence knowing you will be able to quickly and effectively defend yourself from any attacker. This brand new model eliminates the need to carry a big, bulky stun gun and yet protects your hand while giving you the power to put down any "bad guy" that gets too close. Designed to work fast in a panic situation, there are no complicated switches or buttons to fumble with. Once that safety is turned off you simply squeeze the Triple Sting Ring and this unit will protect you from any attacker. People have a natural fear of electricity so just the site and sound of the electronic charge at the end of your fist is enough to repeal most attackers. However, if that is not convincing enough a touch from this unit certainly will be! The rounded base feels natural in your hand, and when gripped firmly it's nearly impossible for an attacker to take it from you. With many outdated stun gun designs on the market today it is difficult to get the stun gun in the correct position for the electricity to contact the attacker. The Triple Sting Ring gives you the power by putting the electric charge on the outside of your fist which allows you to make contact with the attacker in a natural offence position. It is also rechargeable so you can know you are protecting the environment while protecting yourself. The Triple Sting Ring is made by Streetwise Security Products, the leader in the personal protection industry, and features a lifetime warranty. •DESIGNED TO DEFEND: Your tight grip around the unit prevents it from being knocked out of your hand. The ease of use, concealability, and strong electric current makes it one of the best new stun gun models on the market today! • TRIPLE STUN: Transforms your fist into electronic knuckles to quickly defend yourself from any attacker. CONCEALED BY YOUR HAND: The base of the unit is concealed inside your closed fist, leaving only the Sting Rings exposed. •SQUEEZE-AND-STUN TECHNOLOGY: Can be activated quickly and easily by simply squeezing it. •SMALL & LIGHTWEIGHT: Eliminates the need to carry a heavy, bulky self-defense product. Ideal for those exercising outdoors or just walking to and from your car. •SAFETY SWITCH: To prevent accidental discharge, the Triple Sting Ring features a safety switch. •RECHARGEABLE: USB Charging cable included. •LIFETIME WARRANTY: The Triple Sting Ring is made by Streetwise Security Products - the leader in the personal protection industry & features a lifetime warranty. If you have any questions about this product by STREET WISE SECURITY PRODUCTS, contact us by completing and submitting the form below. If you are looking for a specif part number, please include it with your message.